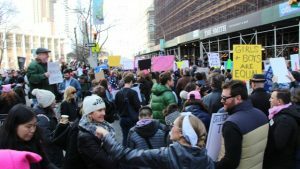 On January 20, 2018, on the first anniversary of Donald Trump’s reign, the United States and all over the world held large demonstrations and protests against Trump. 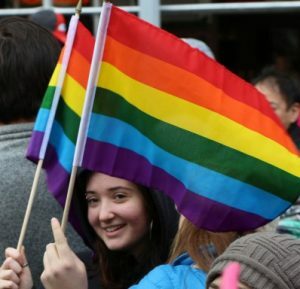 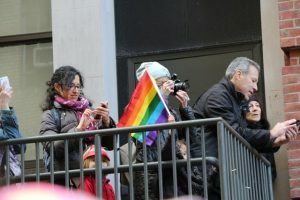 Including Cleveland, Los Angeles, San Francisco, Philadelphia, New York, Chicago, Austin, Rome, Italy, Toronto, Canada and other major cities in the world, the parades are simultaneously held. 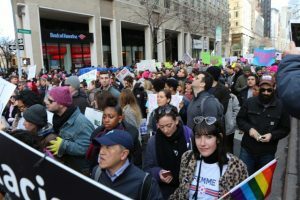 Hundreds of thousands of people took to the streets, on Trump’s anniversary to oppose Trump’s policies and support the recent #MeToo campaign against sexual harassment and sexual assault, calling for women’s empowerment. 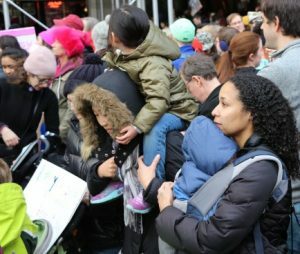 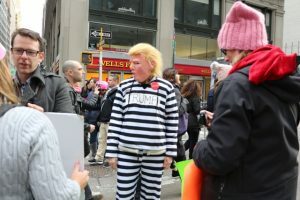 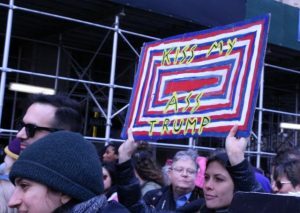 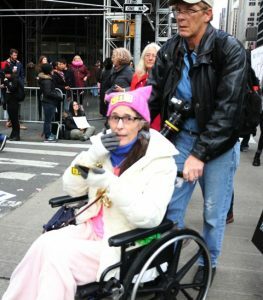 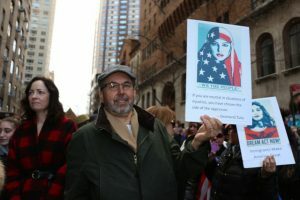 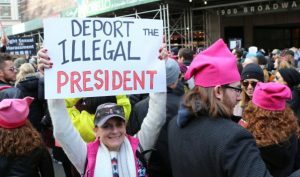 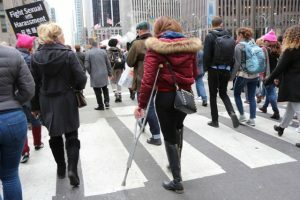 Millions of Americans did the same thing on the same day by going to the streets to protest against Trump’s presidential year-long injury to the United States on U.S. policies and issues such as healthcare, immigration, environmental protection, women’s rights and education which greatly damaged the U.S. international image and position. 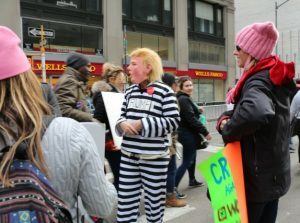 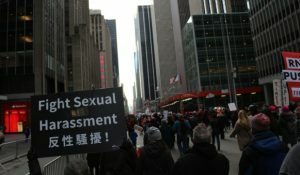 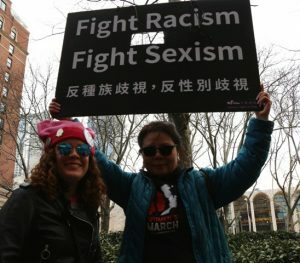 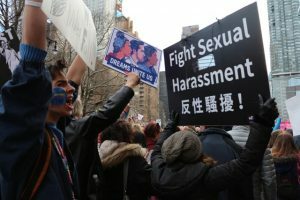 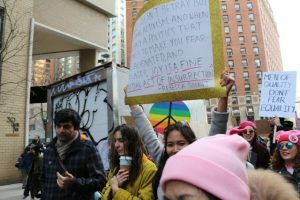 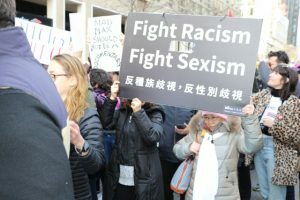 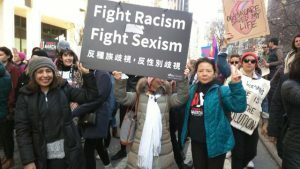 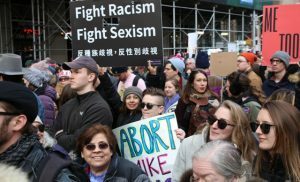 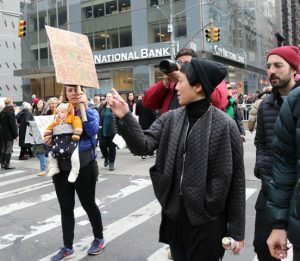 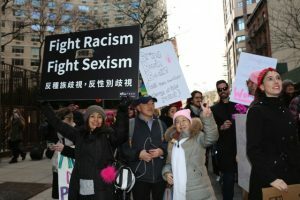 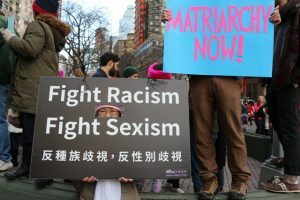 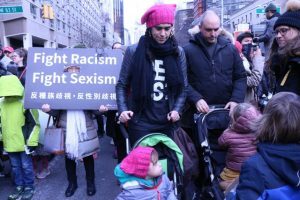 Women’s Rights in China, after attending the Women’s March anti-Trump parade in Washington, DC last year (2017), once again participated in the protest at Women’s March in New York City, yesterday (January 20, 2018). 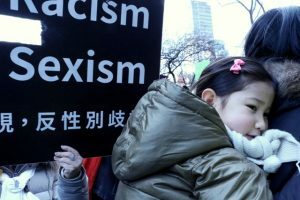 The banner slogan was Anti-sexism, anti-racial discrimination and anti-sexual harassment. 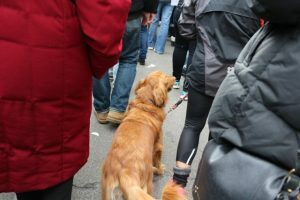 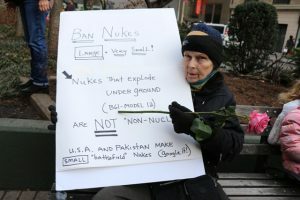 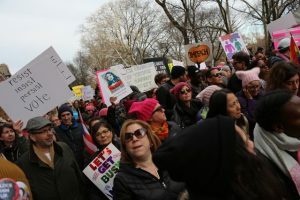 More than 200,000 New Yorkers were in downtown, spanning over 20 streets including the Central Park, parading around. 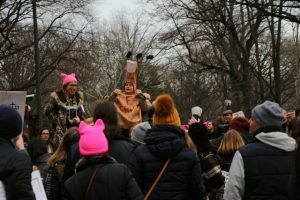 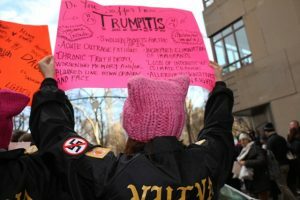 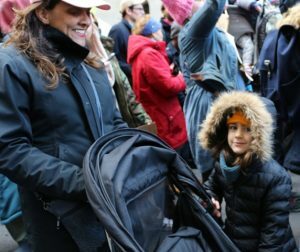 Men and women wore pink cat hats to protest Trump’s sexual harassment and their contemptuous and disrespectful remarks. 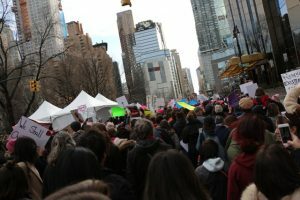 The long parade reunited with a stream of pink people, meandering through downtown New York. 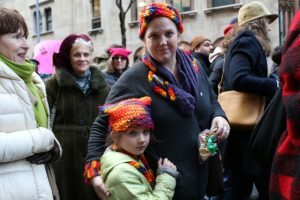 Many of the participants in this year’s parade are family members. 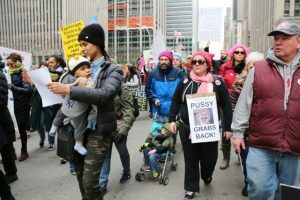 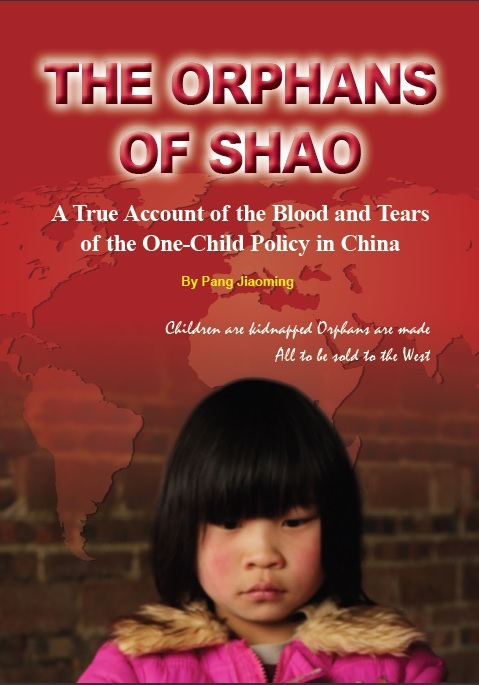 Mothers and fathers held their children and pushed babies in strollers, the elderly and disabled people in wheelchairs. 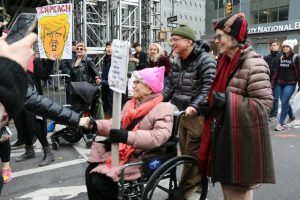 Some of them even had crutches and still go to anti-Trump demonstrations, making people admire them and being moved. 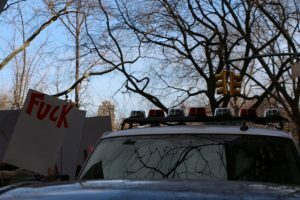 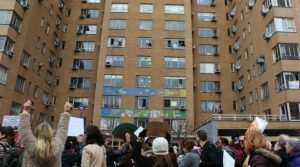 Some slogans of anti-Trump slogans were also displayed on the windows of some street-side buildings, some striking the percussion drums to attract attention, some interacting with the people in the streets and some applauding each other while shouting slogans to encourage continued resistance. 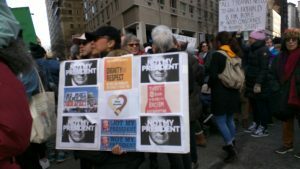 “Shithole Hotel! 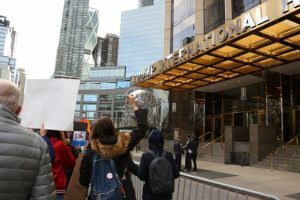 Shithole Hotel!” were the chanting words when people passed by Trump International Hotel near Central Park, this phrase “shithole” was very derogatory used in Trump’s meeting not long ago when it comes to the issue of the immigration of African countries to the United States The dirty word, the “shithole countries” sparked a wave of protests. 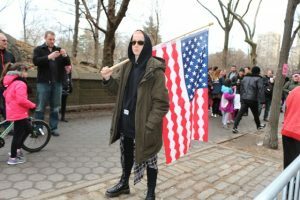 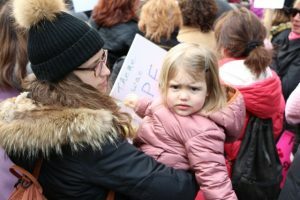 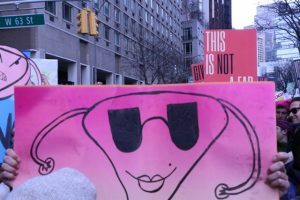 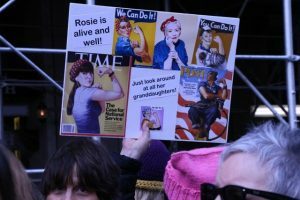 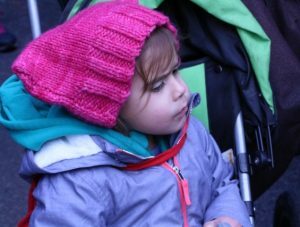 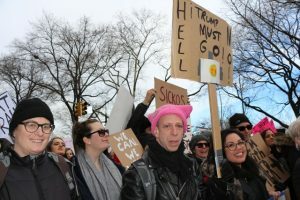 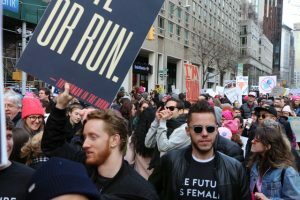 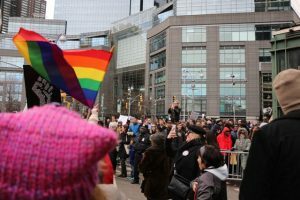 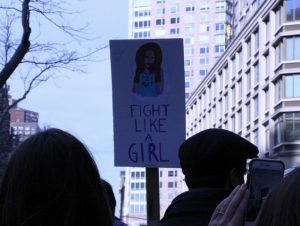 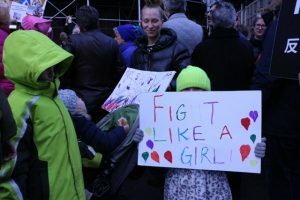 One of the hallmarks of this year’s Women’s March parade in New York City is that nearly a quarter of the participants are men, most notably young men, who are at least 6 or 7 times more than last year and have a wider range of placards. 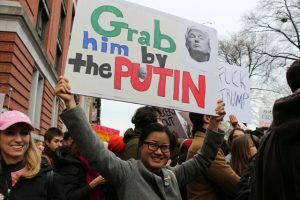 It can be seen that in the past year since Trump came to power, people especially women became dissatisfied with Trump and his actions.